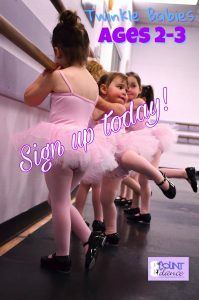 👯‍♀️Twinkle Babies – Sign up today!! With 6 class times to choose from! 🎉Welcome to Twinkle Babies!! A 30-minute introductory dance class containing ballet, tap, and creative movement. Young dancers will learn the basic steps while learning how to follow direction and imitate movement in a positive environment. Engaging music is used to get these little guys inspired to dance. The use of props such as Twinkle Bears and hula hoops enables the young dancers to use their imagination, creativity, and most of all, have fun! Tap & Ballet shoes recommended. Class begins October 15 & runs thru December 3! Class begins October 16 & runs thru December 4! Class begins October 17 & runs thru December 5! Class begins October 27 & runs thru December 7!